The Jew who delivered Jewish children to the Nazis, he was one of the Holocaust’s most controversial figures. 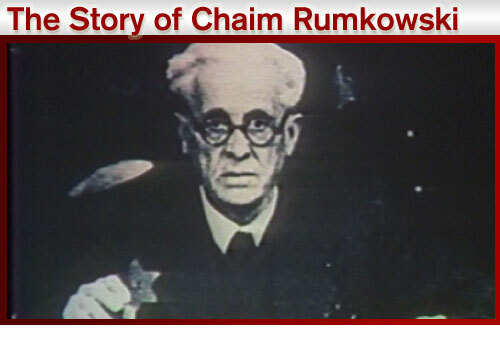 The Story of Chaim Rumkowski offers a balanced depiction of this man whom the Nazis appointed as Jewish leader of the Lodz Ghetto. “I must stretch out my hands and beg,” Rumkowski declared to Lodz ghetto inhabitants, “Brothers and sisters — hand them over to me! Fathers and mothers — give me your children!” With these words, a man who once directed an orphanage pleaded for Jewish parents to peacefully surrender their children to extermination camps. When Rumkowski, a childless sixty-two-year-old man with billowy white hair and black circular glasses, was appointed Elder of the 230,000 Polish Jews in the Lodz Ghetto, he created an industry within which Jews could work and make themselves useful to the Nazis – in what he said would help avoid the slaughter of the Holocaust. But his record of establishing an oasis for Jews there is overwhelmed by the fact that to appease the Nazis he handed over almost the entire population to Nazi extermination camps. For more than half a century, scholars have debated whether Rumkowski was a Nazi collaborator or someone really trying to save his fellow Jews. If Rumkowski would have survived the war he could have either been honored for the lives he tried to save or executed for his collaboration with the Nazis. Shocking old photographs and the only surviving film footage of the Lodz ghetto serve as the visuals for a story that asks how much people should be willing to compromise in order to survive. But then, when the Nazis began to demand Lodz inhabitants be relocated to extermination camps, Rumkowski selected who would be sent away and asked that they leave without hostility. He began by sending away the ghetto’s criminals, but eventually pleaded that parents allow him to send away their children. Rumkowski’s story raises difficult moral questions regarding power and compliance. “We must cut off the legs in order to save the body,” Rumkowski asserted. But at what point should the body fight to save its legs? When does compliance become collaboration? The disillusionment and corruption that comes with power seems to have eventually touched him. It would seem that negotiating with evil inevitably led to becoming evil. While Rumkowski assured his Jewish followers that he was fighting to save their lives, bargaining with the Nazis led him to a crucial error. He, like the Nazis, began to see people as numbers and not as individuals. The incredible film footage of Lodz that the documentary offers brings to life one of these “numbers” Rumkowski decided upon. In one shot, a little boy with the Yellow Star on his arm stands, open-mouthed, in the snow — revealing the big gap between his two front teeth. It’s hard to imagine sacrificing this one little boy for any greater good. The same complexity that’s found in Rumkowski’s character is manifested in the Lodz ghetto itself. The thriving textile industry in the ghetto might have kept its inhabitants alive, but the goods they produced were a tremendous service to the Nazis. The Jews in the ghetto, unknowingly, helped build and facilitate concentration camps through Europe. They fed the hand that bit them.